Ash conveyor systems designed specifically for conveying hot, abrasive ash such as bottom ash or fly ash from boiler beds, bag houses, or electrostatic precipitators. These systems can handle temperatures up to 650F (1800F with assembly) and can be arranged in a single line of 1 to 10 units. The Macawber Pneumatic Ash Conveyor Systems also use about 50% less energy than typical fly ash conveying systems. The Ashveyor’s small cast iron vessels to not require a vent valve, a level probe or a discharge valve. Each cycle clears away deposited ash from the feed hopper leaving them empty. 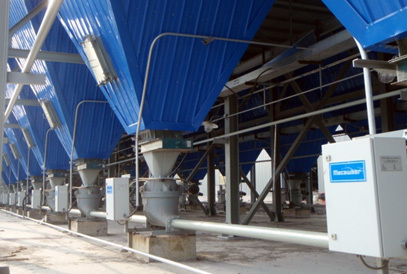 Each line of ash conveyor systems on each ESP field, economizer or bag house cycle simultaneously to transfer the ash through a common pipeline. 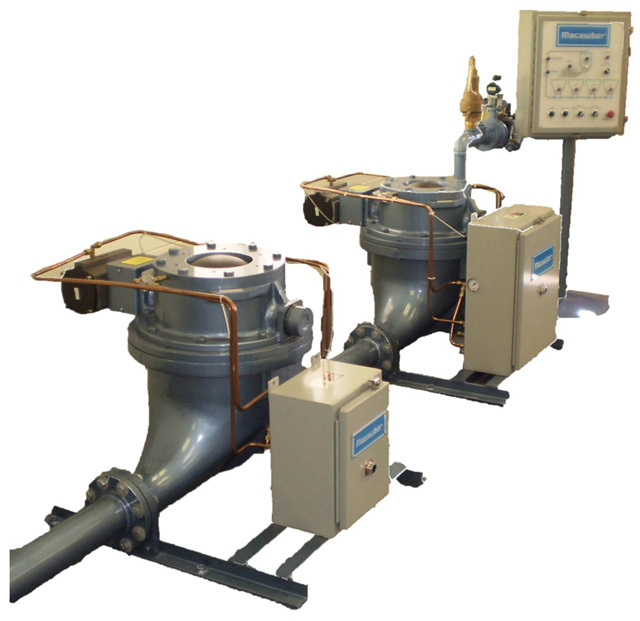 Diverter valves for each feed point are not required and system controls are equally as simple. Ash has accumulated in the hoppers sufficiently to contact one of the level probes. All dome valves (1) open and unseal automatically. The air valve (2) remains closed. All dome valves (1) remain open during filling. Air valve (2) remain closed. Ash levels in hoppers fall as the ash fills the Ashveyor transport vessels. The Ashveyor vessels are now full. The hoppers are empty. The air valves (2) remain closed. All dome valves (1) closed and sealed. The conveying air valve (2) opens. The system pressurizes and the ash exits the Ashveyor vessels and enters the conveying line. All dome valves (1) remain closed and sealed. Air valve (2) remains open. All of the ash is in the conveying line. Coal gasification is an upcoming clean coal technology whereby the carbon materials in the coal are removed before the combustion process takes place. The gasification process is proven and is operational in several commercial and demonstrational plants worldwide. In the case of our customer Synthesis Energy Systems, there was a need to handle waste material from the gasification process while keeping the customer’s process pressure up. Macawber achieved this requirement with two x 8/8-4/8 Denseveyor Pressure Letdown systems for removal of the waste material originating from coal gasifier baghouses and electro-static precipitators. The systems were designed to operate at baghouse and ESP pressure for filling and then lock down to atmospheric pressure for conveying the waste material away to storage while maintaining process upstream pressure. Problem: Large brewery wishes to recycle waste grain and malt from the brew process for the production of electric power. Handling the biomass ash cleanly and economically was required. Solution: Macawber pneumatic conveying systems were used to convey boiler bottom ash and fly ash away to storage. The biomass is dried and transferred to a boiler where it is burned with #6 oil. The biomass fly ash is gathered from four electrostatic precipitator (ESP) hoppers and pneumatically conveyed to an ash silo. The bottom ash is crushed and transferred a short distance via customer’s mechanical conveyor to a pneumatic conveyor where it is transferred to an ash silo for truck loading. Power Gen PLC of Retford, England rely on Macawber engineering at their Cottam Power Station (4×500 MW) to replace an existing fly ash handling system. The Macawber AshVeyor System was installed on unit #2 to continuously convey pulverized fuel ash (P.F.A.) over a distance of 560 feet. The London Waste EcoPark is a 17ha site with a number of Centres used to reduce the amount of waste sent to landfill. The Eneergy Centre uses combustion to generate electricity from 500,000 tonnes of trade and domestic refuse per year on a continuous 24-hour operation. London Waste purchased a total of twenty MultiAshflo conveying systems (four per ESP) with each system collecting the precipitator ash from purpose built hoppers and conveying it to the existing Flue Gas Ash storage silos. All of the MultiAshflo conveying systems are Teflon coated for addressing the corrosive and cohesive nature of the precipitator ash caused by the absorption of moisture during the combustion process.